for Safaiwala Jobs through online. Online application submission starts from 27-October-2017 till 26-November-2017. Selection for this Safaiwala Jobs in CBA Recruitment is based on Skill Test and written test. Date of written test will be uploaded on the website on 26th November-2017. After selection candidates will be paid for Clerk Jobs is Rs. 10,300/- to Rs. 34,800/- plus Rs. 3200 GP. For Safaiwala Jobs Candidates will get Rs. 4900/- to Rs. 10,680/- plus Rs. 1650/- GP. Application fee for General candidates and OBC candidates is Rs. 500/- and for other SC/ ST candidates is Nil. 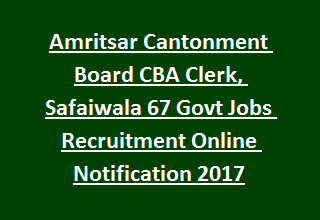 Please go through the details given below for Age, Pay Scale, Educational Qualifications, Application Fee, Selection Process and Application Process details of Amritsar Cantonment Board Recruitment Clerk, Safaiwala Vacancies. Cantonment Board CB, Amritsar has released total 67 posts filled through competitive examination. Clerk: Bachelor degree from recognized University. Must have experience in computer or Information Technology in office productivity or Desktop publishing applications. Should have typing speed of 30 WPM in Hindi and 40 WPM in English. Safaiwala: Must have qualified 8th class. Maximum Age of the candidate is 25 years for general candidates. OBC, Ex-Serviceman (UR): 28 years. Candidates will be selected for Clerk and Safaiwala Jobs in CBA Recruitment is based on Skill Test (Qualifying)/ written test. Syllabus and exam date will be uploaded on the website shortly. Candidates with essential criteria need to go through the CB, Amritsar official website www.cbamritsar.org.in to apply for CBA Recruitment Safaiwala Jobs. Open the recruitment link Select Amritsar in Cantt Board and select the proper post. Complete the application procedure and submit through online from 27-10-2017 to 26-11-2017. Application fee for UR/ OBC candidates is Rs. 500/- paid through online payment mode. For SC/ ST category there is no application fee.